Was a minute 56 secs slower than my Feb Half Marathon in Hyannis. 😦 And my pace was off by 9 seconds! In Feb for Hyannis, I was in training for the Boston Marathon and at the top of my training. 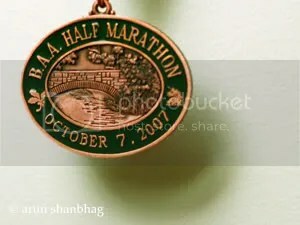 This half marathon was to be a practise run for the New York City Marathon in Nov. But I did not get into the NYC lottery, making it difficult to get motivated. And I suffered from heel pain all summer (now you know why I wrote all those heel pain articles) and could not run on my heels for most of my training. Today was the first time in months that I ran any distance on my heels ~ and transiently felt a stab of pain at about mile 6. No excuses! A fabulous run and I am very pleased. In this off-season, needed to maintain form and was expecting to do better than a 9:00 minute pace. And did way better than that! Now I rest for a few months and restart training in Jan for either the Boston or London Marathon in April 2008! Yaay! Run ARUN Run! Karnataka Cuisine: What a feast it is!